One morning, after Khin and Connie go to the office, Susan and I take a taxi to the Central Train Station. We ask for the Circular Train and are directed to platform 7. A small ticket office on the platform proclaims Warmly Welcome & Take Care of Tourists. We go inside the office where 3 men work, and the one behind a table directs us to sit down. He writes out the ticket for “Cheryl Wilfong + 1”, so Susan doesn’t need her number. After waiting for just a few minutes, the train rolls in and we board a window-less, door-less car. What I mean is that the car is completely open-air. There are no doors in the spaces where doors would otherwise be, and there are no windows either. Once we get going, we can feel leaves of tree branches brush the skin of the elbows we have propped on the edge of our open window. The mint-green molded plastic seats run length-wise down both sides of the car; they are in no way ergonomic. If you slouch back into it, the top rim hits you in exactly the wrong place in the middle of your back. Tall Susan sits erect without benefit of any back support–at least to begin with. My legs are short and dangle above the floor., so I immediately do what everyone else is doing: Face forward and cross my legs on the seat in front of me, meditation-style. 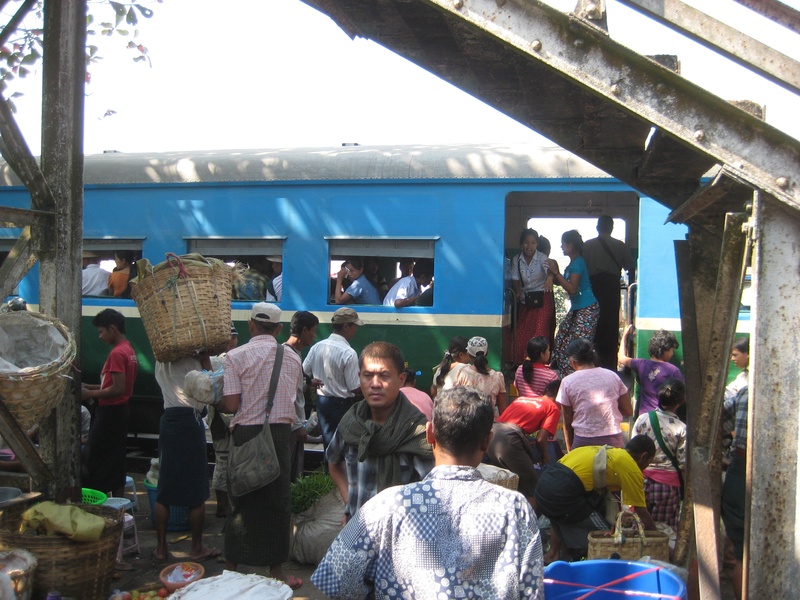 This is a poky local train that takes 3 hours to complete it’s circle around Yangon. Local people get on and off. I can’t see that any of them have a ticket. School-uniformed boys in white shirts and dark green longhis cluster at the open door wearing their backpacks and probably daring each other to do what boys everywhere dare. A man selling mandarin oranges walks through, and, through sign language, I buy 4. An hour later, A teenage girl and boy come by selling corn on the cob, boiled in the husk, and I buy one of those as my lunch. One stop is especially lively. It’s a market with large trash bags full of fresh vegetables being hoisted onto the train, through the open windows and piled in the wide middle aisle, so that the design of the length-wise seats now makes sense. The only way to walk through the car now is to waddle over 3-foot tall bags stuffed with something or other. I watch a young woman next to me, with a plastic grocery bag full of small green eggplants, cluster them in groups of 6 band twine them together. By now, we have left behind the dusty shacks alongside the railroad and are now rolling through neat green gardens on one side and green fields on the other. I breathe deeply to feel such verdant spaciousness. I am beginning to look more frequently at the maps in the Lonely Planet guidebook and at Susan’s watch. It seems this trip must surely take 5 hours, but then, surprisingly, we arrive back at the Central Train Station. As advertised, the trip took just 3 hours. This entry was posted in DHARMA REFLECTIONS and tagged eggplant, market, Train, Yangon on January 22, 2013 by cherylwilfong.